Are you using the "wrong" view? Is Name Only selected at the top of the Address book dialog? When More Columns is selected as the Search option, the address book will only display names if you search. Is the expected address book set as the default address book? 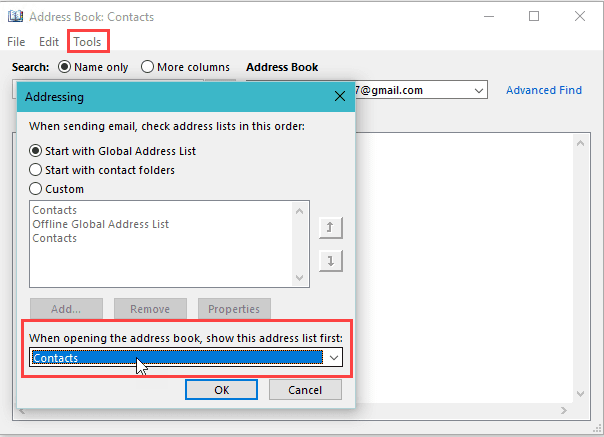 Which contacts folder is selected in When opening the address book, show this address list first? Is the Contacts folder enabled as an Address Book? Make sure the Contact folder is enabled as an email address book. To do this, right-click the Contacts folder, choose Properties then Outlook Address Book. Is the box to Show this folder as an email address book checked? In Outlook 2013 and up, the Show folder as an email address book should be checked and grayed out for the default address book. If you have Microsoft Exchange accounts in your profile, each Exchange account's default contacts folder will be enabled as an address book and grayed out. If this is not checked but grayed in Outlook 2013, Outlook 2016, or newer, you'll need to make a new profile to fix it. If you are using Outlook 2007 or Outlook 2010 and the checkbox is grayed, you'll need to remove the email account and re-add it or make a new profile as you can't remove the Outlook Address Book service in these versions. ...and you use Outlook 2003: Go to Tools | Email Accounts, choose View or change existing directories or address book. Is the Outlook Address Book present? If it isn't listed, add it and close and restart Outlook. 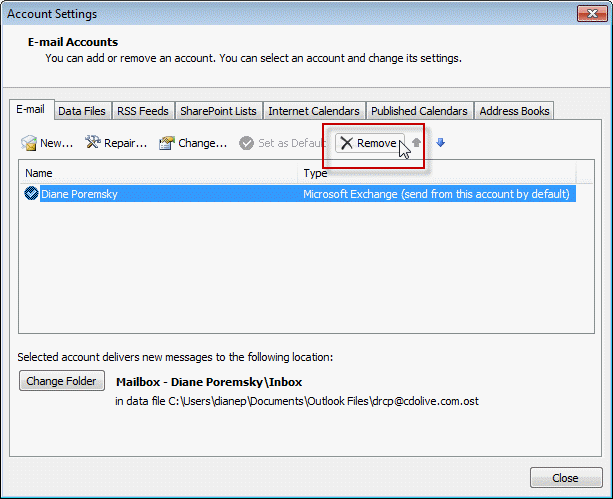 If it is listed, then remove it and close then restart Outlook and repeat these steps to add it. If only imported addresses are missing from the address book, the addresses need to be resolved. If you have just a few, you can delete the email address from the contact and retype it, then Save the contact. If you have a lot of contacts to fix, a macro can make short work of it. See Imported Addresses are Missing from Address Book for the macro and instructions. If the solutions above do not fix the problem, your address book may be corrupt. You may be able to fix it by removing all accounts from your profile and adding the accounts back, otherwise, you'll need need to make a new profile. In many cases its better to make a new profile because a missing address book service means the profile is corrupt. This is especially true if you used Windows Easy Transfer to move the profile from one computer to another. Taking the time to make a new profile now may save you a lot of time in the future. Go to Account settings, Email tab and select the account. Click Remove. Click Add and recreate the account. My Outlook Address Book is suddenly no longer showing me the full list of addresses. They are still there because if I search for a particular address it finds it, but I cant see the full list. Oops, okay I have found the problem, the "Name Only" button had been changed to "More columns"
Dear Diane: A co-worker recently was trying to be a good samaritan and clean out her email folders. She inadvertently deleted her default .pst folder. (I have NO idea how she even got to those folders?) I found the .pst in her trash bin and restored the file, but now her address book is gone (along with several other folders that were, at one time, present along with inbox, sent, etc.) I have looked at the properties page of her address book and 'Show this folder as an email address book' is indeed grayed out. I see your steps listed if it's grayed out, but I wanted to check and see if perhaps there is any other solution to recover her address book, now that we know she deleted her default .pst first? Thank you... I've used your site before, and it's appreciated. Hi Diane, I am using outlook 2003 on my new computer and have migrated the Contacts successfully. As much as the addresses are there in the Address Book, I cannot auto complete the email address when I type a new email. Please help. are they working yet? addresses won't show up until after you send mail to the address. Hi. It's my understanding that to export my Contacts in a CSV file, I need to grab the Contact folder from my Nav pane. But I don't have a Contact folder! Never saw one in 7 years of Outlook 2010. So I tried to create one per your instructions. I did this TWICE using two different parent folders, and the folder did not show up either time. I rebooted, closed and reopened. Nada. Help, please! Do you see it if you switch to the Folder list (Ctrl+6) ? If not, what do you see? Does this apply to Outlook 2016? When I click on the email button on a Contact record I get Select Name: Contact instead of an opened email with that contact addressed. The first part does, but you can't repair corrupt address books and need to make a new profile. To be clear, you select a contact from the contacts folder and click Email button in the ribbon and get the select name dialog? If you open a contact and click the Email button to the left of the address field (under Full name, company, file as etc), you will get the select names dialog - that button is used to select and view Email1, email2, and Email3. When I use the email button on the ribbon (thank you for pointing that out) I get an email opened up with both email addresses (this contact has 2 email addresses) - is this normal? Unfortunately, yes. When you use that button with one contact selected, it adds Email2 (and Email3) if present - you need to delete the one you don't want to use. If you select 2 or more contacts, it will add just Email1 from each contact. Didn't the Email button to the left of the address field used to open an email with the address that is selected? No, te email button has always opened the address book. I will see if i can find an old virtual machine and grab a screenshot. As an fyi, this is the screenshot from outlook 2003 - https://www.screencast.com/t/pM6groXwER - 2007 and newer uses the same design as 2013/2016, with 1 button for the email2/3 selector and the address book picker. These were separate in 2003 and older. Sorry i missed this earlier (trying to work my way through 300 comments :() - did you get it fixed? If the you are in the contacts folders and not seeing results, it could be a corrupt view - restart outlook using the /cleanviews switch. views are stored in the default data file, so a new profile won't fix it, if you use the old data file. If you suspect the pst is corrupt but can open it in outlook, you could try exporting it to a new pst. Exporting will not include views, rules, and a few other things that are stored as hidden files in a pst that could be causing the corruption. soo Any soultion plz it's too important !!!!!!!!!! I am seeing this behavior on Outlook 365, apologies if this is the wrong thread, but I can't find any info specific to 365. The contact is listed in my contacts, I have sent and received email to/from him, but the only way he appears in the search is if I type his email and not his name. I verified that the name is listed correctly in my contacts, etc. Any help would be appreciated! If you click the To button, is the contact listed? if not, then the contact could be missing a resolved email address.